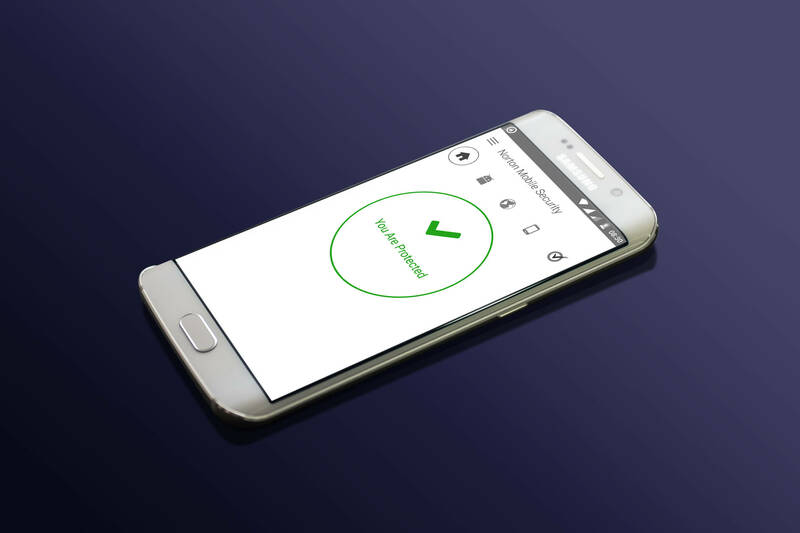 We’ve got a bunch of mobile security apps for Android. But, usually, users are unable to decide which one among them would be the best. However, it’s hard to say that and we’re not going to discuss it here either. And, we’ve got one of them installed on one of our devices to review it with proper insights. So, you’ll get a better picture of whether you really need it or not. Also, if someone tells you that mobile security applications are not needed for Android devices, it’s partly true. However, getting them installed on your device has some of its own benefits. Now, let’s move on to review the Norton Mobile Security app for Android. We got it installed on the Moto X Play running on Android 6.0.1. The APK file size being 11 MB in size. However, after installation, it took around 42 MB of storage space and consumes hardly any battery juice. So, it definitely is resource friendly. 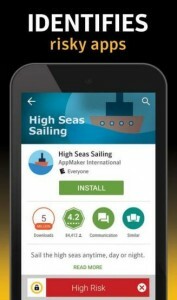 It is available for free on the Play Store with a 30-day trial period. And, you can opt for the premium plan as well at INR 599 ($9) per year if you wish to continue. It offers a quite interesting feature which is worth the premium plan for some (that includes me!). The feature which I’m talking about scans the app right at the Play Store before you download the app. The factors on which it warns is basically about the privacy risk, whether the app collects SIM card details, IMEI number and other information which is tagged to be your personal data. The second important factor it checks for is – in-app advertisements. Other factors include the approximate background battery usage level and background data usage. And, it’s truly the best app advisor we’ve come across so far. It also works on the device even if not enabled for Google Play Store. You can backup all of your contacts to the Norton account and use it on multiple devices to make sure you don’t lose all your contacts or if you don’t want the same google account on the other device. Then onwards, you could use the Norton account to sync the same contacts. You can schedule the backups to kick in every day or once a week. In order to recover or protect the data when the device is lost, it offers three primary anti-theft features. First, the basic security lock i.e enabling Norton mobile security as the device administrator to prevent others from uninstalling the app. The second feature wipes your device after 10 failed unlock attempts. And, the best for the last – a SIM card lock option, which locks the device if SIM card is removed or changed. Most of the users love automated things. So, you can schedule scanning your device on a weekly/daily/monthly basis. In addition, you can enable/disable to scan the SD card for possible risks. Probably you’re not having an inbuilt call blocking feature. So, you can utilize Norton Mobile Security in order to blacklist some of your contacts or a specific unknown number. This service proactively works only for Chrome on Android. 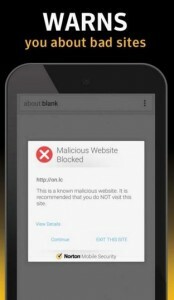 We encountered every fraudulent website flagged by Norton Mobile security and also warns about the sites which contain too much of advertisements pointing to malware files. It’s quite impressive. Norton’s trusted network automatically checks for new threat definitions and new components to keep the security up to date. We didn’t observe any noticeable battery usage by the app nor the device’s performance was affected. However, while scanning the SD Card, the process did affect the device’s performance at times by taking a significant amount of resources. But, the app notifies you that it might affect the device while scanning the SD Card. So, it’s the ultimate user’s choice. It takes around 100 – 121 MB RAM with 4 services running all day long. And, still the app doesn’t consume much of the battery juice. At most, the app drains around 1% of the battery at most observed in our case. Is it the security app you’ve been searching for? Do you want us to review one of your favorite security apps for Android? Let us know in the comments section below. An incredibly resource-friendly & feature-rich security app for your Android device! Previous articleReasons NOT To Buy iPhone SE – Watch This Video! !